In previous reviews I’ve written, I mentioned that I spent some time in Costa Rica. While it was great for getting to grips with some useful travel gear, such as dry bags and pocket knives, it also led me to completely reevaluating my coffee consumption. Enamored by this newfound way of making coffee, I brought a fancy schmanzy, carved, wooden chorreador home with me from the market in San José. It’s certainly the most environmentally-friendly way of making coffee: none of the unrecyclable, harmful capsules from Nespresso machines and the likes of those, and not even the paper filters of your regular coffee machines. Just the energy to boil a kettle, and the water that goes in it. Unfortunately, that was over three years ago. My colador had gotten quite grubby. It was permanently stained brown, and was developing some holes. Ground coffee would frequently escape it into the pot. I had to find a new one. Now based in New York City, which has a relatively large Hispanic community, for some reason, I didn’t think it would be too difficult for this Gringo to get his hands on one. However, I didn’t have time to go traipsing through the city looking for one, so I hit the internet, and Amazon provides. All of the coladors I was coming across seemed to be far too big for my chorreador. Most of them seemed to say they came with a four-inch diameter. The opening at the top of my chorreador was only 2.5 inches. I had been looking at this one from Bene Casa. The product page on Amazon didn’t give its dimensions, but I guessed it was a smaller size from the price. I had to do some Googling to get some dimensions, and eventually found one saying it was 2.5 inches in diameter. Perfect! I was impressed with how promptly the colador was delivered. It wasn’t on Prime or anything, but I had it from Florida in a couple of days. When I first opened the package, I was immediately concerned. It was definitely much bigger than 2.5 inches. It was actually oval-shaped, measuring 4 inches at its narrowest, and 4.5 inches at its widest. Additionally, the colador wasn’t as long as the one that came with the chorreador. It would be fine for making a mug just for myself, but I had some doubts about whether or not it would hold enough coffee when I make a pot for myself and my fiancée in the mornings. Obviously, this was a little bit awkward. I really needed a colador, but this was so big. Should I keep having bits of ground coffee in my pot when I pour, and return this colador? I decided that as it was so cheap, it would be OK to at least try it, and if I couldn’t return it, it wouldn’t be too much of a financial hit. I gave it a good wash under the faucet first, then put in a few scoops of Vienna/Mocha blend from Zabar’s, as I’d normally do for two mugs in the morning. The coffee actually fitted fine, but I knew I’d need to figure out something else if we had guests over. I was pleased to discover the wider diameter made absolutely no difference whatsoever to preparing my coffee, so I was relieved and pleased with that. 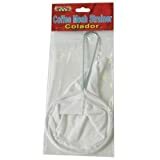 Bene Casa BC-85024 Colador for Coffee. I’ve been using the Bene Casa colador for a couple of months now, and it’s still in great condition. It makes me wish I’d taken better care of my original one – I had a bad habit of leaving the used coffee in there for days. It’s not just having a usable colador that I’ve been delighted with, the difference it’s made to the taste of my coffee has been phenomenal. Despite my initial reservations, I’m so pleased I tried this out instead of immediately returning it after seeing its size, and get to enjoy great tasting, environmentally-friendly coffee every day. I think it’s safe to say the worst thing about this product is the inaccuracy of the product description, so hopefully if you’ve been thinking about it, this review will help you make a decision in your purchase. Next Review: RFID Blocking Ultra Slim Wallet – is this the perfect minimalist wallet?